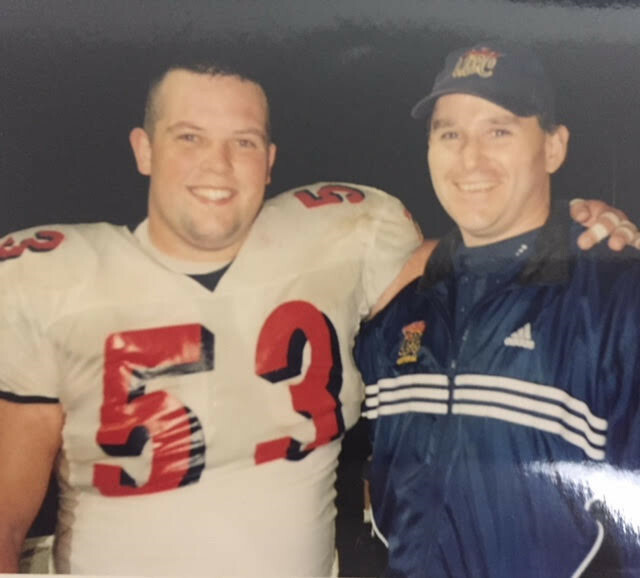 With Coach Howie after a game my senior year in University. Still there supporting me long after my High School days. I got a message the other day from my old high school position coach, seeing if I had time to meet up. Morning coffee was the offer. It has been 24 years since Coach Howie taught me how to play football but he has always stayed in touch. He still watches over me, following my progress and checking in from time to time to offer congratulations or support, depending on the situation at hand. I feel an amazing sense of both comfort and gratitude knowing he still cares that much about me. Maybe that’s the reason I have always and will always call him coach. He didn’t mention any agenda, just that he wanted to get together. We small talked over coffee, chatting fatherhood and football. 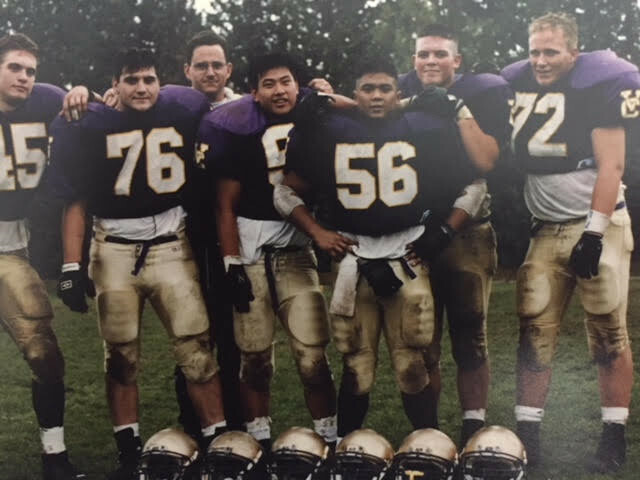 Sounding like grumpy old men, we preached to each other on how we are getting soft as a society, and that we need high school football more now than maybe ever. It was fun banter, but I knew there was a specific reason for this get together, I just couldn’t place my finger on what it was. As our chat was coming to a natural close, coach reached into his bag he had under the table and pulled out a folded up white football jersey.  What was this?? The unveiling of the jersey came with a brief explanation. 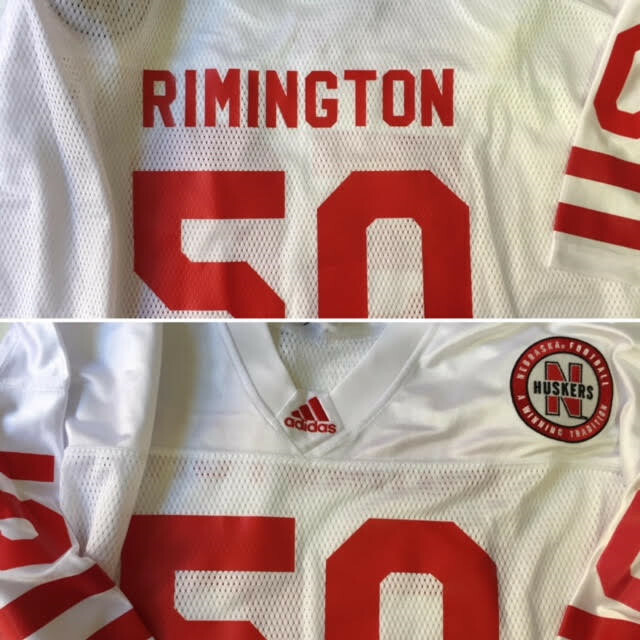 Coach had read my “Write your fans back” piece online the other week and was so moved that he had reached out to Nebraska and had them make up an authentic Dave Rimington jersey for me. I was speechless! First off, I had no idea that he had even read my piece, but more overwhelming was the fact he took such thought out and detailed action in response. I’m still blown away two weeks later thinking about it. You see a coach who cared about their players back then, cares about them always. Once my coach, always my coach. The great John Wooden once said, “A good coach can change a game. A great coach can change a life.” I’m sure each and every one of you that played amateur sports has a person that fits that description. I’m extremely lucky. I have two. I started football much later than some. I was a hesitant 16-year-old, a little worried that maybe I was coming to the sport too late to have a real chance. But from the moment I walked into my first team meeting, two coaches changed all that. They taught me everything I needed know about not only football, but more importantly, how to act and prepare professionally, how to believe in yourself and your dreams, and what it takes to make them a reality. 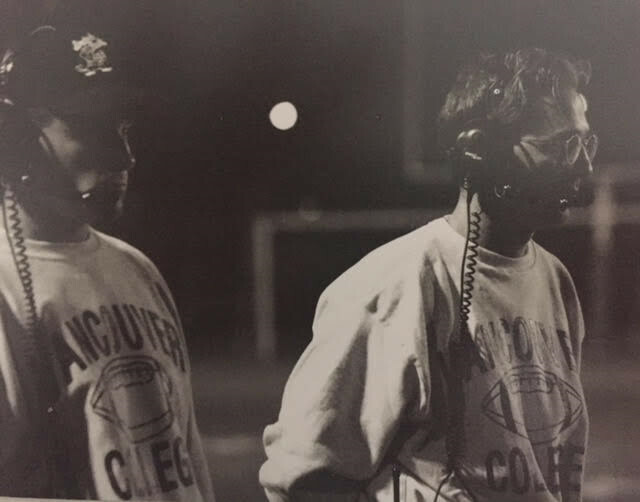 Coach Howie and Coach D. Working their magic during a game my senior season in '93. Paul Dal Monte was my head football coach at Vancouver College and Anthony Howie was my positional coach. Both men were teachers at the school and volunteered their time, for both the love of the game and their want to help grow and encourage us young men. Both Coach D and Coach Howie knew the sport and were able to teach and coach it at a very high level. Our teams on field record over their tenure was proof that they were both great at building and producing winning football teams. Looking back now what I really see is two men that gave their time and were great at building and producing confident, accountable, mature young men. Coach D showed me right away at the age of sixteen what it meant to take something seriously and to really commit. Meetings were held at lunchtime and being one second late was not accepted. Off season team lifting was always mandatory, and was sometimes held in the mornings before school. Mandatory meant just that, if you were going to play football on his team, you were going to be fully committed and present. I learned what it was to not just watch film but to study it. To never miss a football practice, for any reason. Standards were set very high, and the expectation of you as a young athlete was set even higher. Perfection wasn’t the expectation, but you had to understand that if you were going to be a part of the team, you were committing to your teammates and coaches and expected to give 100% every day. As well as being my English teacher, Coach Howie was my offensive line coach. A former college lineman, coach Howie had a great understanding and true passion for the game. It was his job to coach me up on the nuances of the position and get the most out of me on the field. Nowhere did it also say it was his role to spend extra time with me in the weight room, guide me through difficulties in all of my school studies, help me prepare game film to send out to universities and most of all, act as an overall confident in my quest to take this sport to the next level. Coach Howie was a big part of my vision building. Helping me build the picture of where I wanted to go with not just this sport, but my life. He told my tales and showed me photos of old greats. Those images and stories laid a huge chunk of the foundation for what I saw greatness as, and created a vivid visual for me to chase. With my high school line mates and a man who helped raise us. Coach D set the standards. Coach Howie gave me the tools and support needed to live them. These two men helped shape me well beyond the football field. I came out of high school with a full grasp of discipline, accountability, attention to detail, and the all-important knowledge that if I wanted something and was willing to work for it, there was no good reason why I couldn’t get it. The surprising part is that their care for me has never ended. Both men have been in my life in some capacity at every twist and turn on my road to today. Always there for both support and advice. It’s no surprise that at my retirement party celebrating the completion of 13 years of playing professional football it was Coach D and Coach Howie (along with my oldest brother) who gave the speeches. They were with me from day 1, ground zero. Helped me build from nothing by both challenging me and giving me the tools needed to face those challenges. 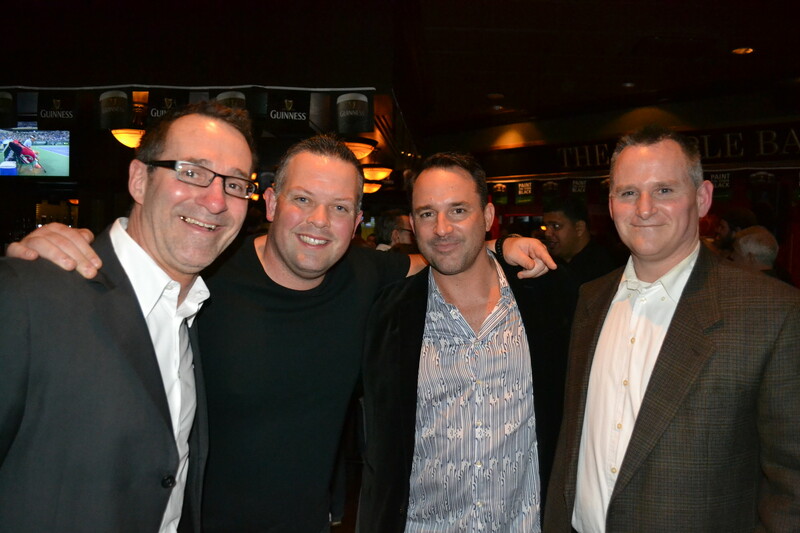 Coach D and Coach Howie, along with my buddy Steve Bajic. Celebrating my retirement from the great sport of football. I’m not sure too many people fully comprehend the impact amateur coaches really have on young athlete’s lives. It usually goes well beyond the playing field. What needs to be really appreciated here is that these men do this in their free time out of the goodness of their heart. I don’t think enough praise can be given to high school coaches and the job they really do. They dedicate their lives to help raise our youth. If you have or ever had a coach that helped you, please remember to thank then, I can promise you they still care about you and would love to hear from you. Coaches, if you’re reading this, from all us athletes at any age that were once on your team, thank you. Thank you for spending your time helping us use a sport to grow up to become responsible, accountable, confident adults. Along with parents, you are my true heroes.